We’d love your help. Let us know what’s wrong with this preview of Messages Of Inspiration by Kay Sanders. Could you use some motivation to go after your dreams? Some inspiration to help you stay focused and in awe about what truly is possible for you? We often forget that we are infinite beings, who can do, be and have anything our heart desires but we often get derailed by our negative and limiting thoughts, the illusions we live by that keeps us playing small because we fear Could you use some motivation to go after your dreams? Some inspiration to help you stay focused and in awe about what truly is possible for you? 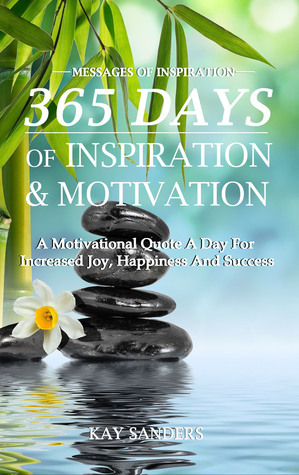 Eva Lukacs a spiritual mentor says: "Messages of Inspiration - Your daily dose of Inspiration and Motivation by Kay Sanders are messages I look forward to on a daily basis. Kay's inspirations are very profound. So thankful for Kay's words of inspiration each day." Omar Turner, Life Coach and Spiritual Leader, says: "Kay Sanders you did it! Your book is a great balance of inspiration with a warm push to take action. The action steps are practical and easy to start. After the first two weeks, I noticed changes within me, on both the physical and spiritual plane. Thank you for your dedication to helping people flourish." If you have had this longing to be, do and have more then don't wait! Don't be that person who envy's others for all that they have, for the great lifestyle they live, for the amazing success they experience, for the joy and happiness they radiate. You too can create this lifestyle for yourself; believe that anything is possible, that you too can have all that your heart desires. Abundance, joy, happiness and great success is not something that is reserved for others; you too can create all the abundance, all the joy, all the happiness and all the success your heart desires. To ask other readers questions about Messages Of Inspiration, please sign up. A motivating and inspirational book with messages of hope and possibility. While at some points the messages may seem to have a similar theme, they are repeated in various forms to make them memorable and simpler for a variety of readers to utilize and digest. This is a book not to be read in one sitting but to be absorbed and acted upon. The message is one about not settling and making wiser choices to allow the life of your dreams to be created especially as you ask for it. Kay helps conscious entrepreneurs find that missing piece to create momentum in their Business and re-ignite their Manifesting Mojo so they can make a difference in the world, create more freedom in their life and tap into the magic and power of manifestin Kay Sanders, known as the Creator of Possibilities is an Intuitive Business Coach, Certified Akashic Record Consultant, and Bestselling Author.